Star Posters and Clouds Paintings with Glow in the Dark Stars! "I didn't realize from the photos that it would be this vivid and bright, it looks so much more amazing than I thought it would be! You did a great job!" Jill K.
MAJOR ANNOUNCEMENT: I decided to create a new website just for my star posters but in a new twist! I am VERY excited to introduce to you CosmicPosters.com. Cosmic Posters Overlay is the newest invention by Jean Eng where a clear film poster painted with stars can be placed on top of ANY existing poster to transform it into a day and night time scene making it the Ultimate Space Poster ever! I am now offering 5 different standard sizes for two themes and with more themes in the works! Click on over to the new Cosmic Posters website to learn more and place your order today! 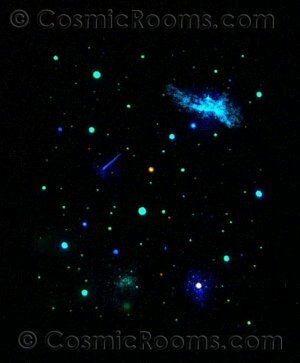 I am happy to bring you the intriguing view of the night sky (and day clouds available too) in a convenient new way. Now you can get a glimpse of the universe through my artistic eyes in Star Posters and Star Paintings! There has been an increasing interest in my murals from folks all over the country asking whether I will travel to paint stars on their ceilings. Ideally, I would love to go to your homes to paint right on your ceiling but sometimes it simply is not possible due to time, locale, and cost of travel. With that in mind, I've come up with the next best thing to solve this delimma! THE SOLUTION: Smaller Versions of my artwork are now available in convenient mailable sizes! These posters and paintings are expertly custom hand-painted by me and will be signed, dated, numbered and stamped with the CosmicRooms.com logo in mysterious UV ink (only seen under blacklight condition) to ensure authenticity. You will only get the very BEST here! And because these are smaller versions of my full size murals, my Star Posters and Star Paintings are sure to be budget friendly and have the added convenience of portability! 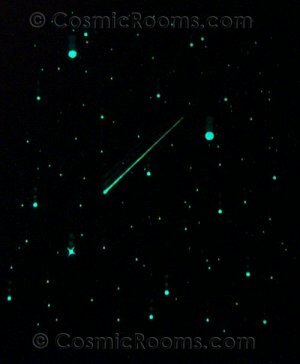 Whether you live in an apartment that does not allow painting on walls or ceiling or if you are planning to move within the next six months to a year, my Star Posters and Star Paintings are a wonderful way to experience the fascinating world of peaceful, beautiful Starscapes® right now, without delay! You Deserve to Treat Yourself NOW, not in a month or 6 months or a year, Life is too short to not enjoy yourself in THIS moment! Give the gift of the heavens to yourself or anyone you love this Christmas or any other special occasion with my Star Posters and Paintings! Please note that this isn't a mass reproduction, no two posters/paintings will look alike, each one is "paint to order" so please allow approximately 2 weeks for your painting to be done and shipped out! I ship priority mail with tracking to anywhere in the United States with a valid mailing address and if you live outside of the USA, please Contact Me for other shipping options. 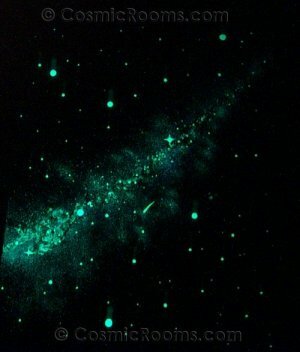 Shipping and Handling cost for Star Posters and Star Paintings start at just $8.95. Complete shipping info is located below. Now imagine if you had 2 posters side by side? That's twice as much "night sky" you'll see! Your posters will come fully ready for viewing right out of the sturdy sleek mailing tube. And don't worry, I am a pro at packaging and will apply my "triple-play packaging technique" so your posters will arrive very secure, protected, and in prestine condition! To view, simply unpack, unroll, shine poster or painting to a bright light source (sun, blacklight, etc) for a few minutes, and take it into a dark room! You will get a glimpse right away at the magic of my murals BUT the true beauty comes out only after you've affixed your poster to your ceiling or wall to be enjoyed each and every night! Complete instructions are of course included with each poster along with a UV stamped certificate of authenticity! Imagine if you had 4 posters all together in a square! 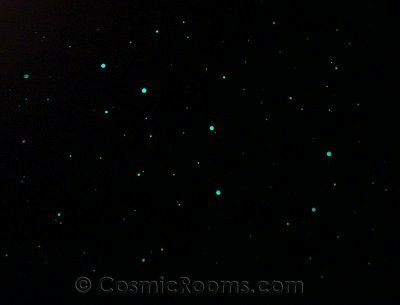 WOW, that's a big canopy of stars soothing you every night! Being that Cosmic Rooms is very innovative in thinking, I'd like to offer you something very special. If you're one of the ones that want to "try it before you buy it", you will love my offer...This added bonus from me is something you won't find anywhere else! Along with each poster is also a Gift Certificate for HALF the amount of your Star Posters or Paintings to go towards a future Full Size Custom Hand-Painted Ceiling Mural by Me! When you're ready to upgrade to a full mural, simply redeem your certificate and you can gift away your poster to someone you care about, they will be thrilled! Or if you want, you may choose to give your Gift Certificate for a friend to use on their very own full size mural, they will appreciate the added discount from you! An Original Piece of Artwork, signed, dated, numbered, and stamped for authenticity by Starscapes® Artist-Illusionist, Jean Eng. Thumbtacks, Clips, and Pushpins to help affix your Star Poster/Painting will be included. Complete Charging and Viewing Instructions for your new starry painting. One Gift Certificate for 50% of your Poster Price that's good towards a future Full Size Ceiling Mural by Me! Shipped in a sturdy sleek tube that will be professionally packaged for added protection and security! Custom Paint to Order Star Posters/Paintings takes approximately 2 weeks to complete and dried thoroughly and will be mailed out by USPS Priority Mail with Tracking Number! In Original Backyard or Deep Space Fantasy themes, these posters will give you a fantastic glimpse of the night sky! Original Backyard is beautiful to behold and is very soothing and peaceful. Deep Space Fantasy is a bit more dramatic and will widen your eyes in amazement at the extra colors and painted objects! Deep Space Fantasy is Cosmic Rooms' Signature theme and is wildly popular in the full mural size and the posters are every bit as striking, just in a smaller version. All posters and paintings can have the option of adding the magnificent Milky Way Galaxy or a Constellation to the painted piece. A variety of medium is available to suit your taste but all are intriguing, mysterious, and dazzling! Don't have a blacklight? You can even buy one from me that's 17 watts and is 24" long!